Are you hosting a winter wonderland party or maybe a Frozen-themed birthday party? 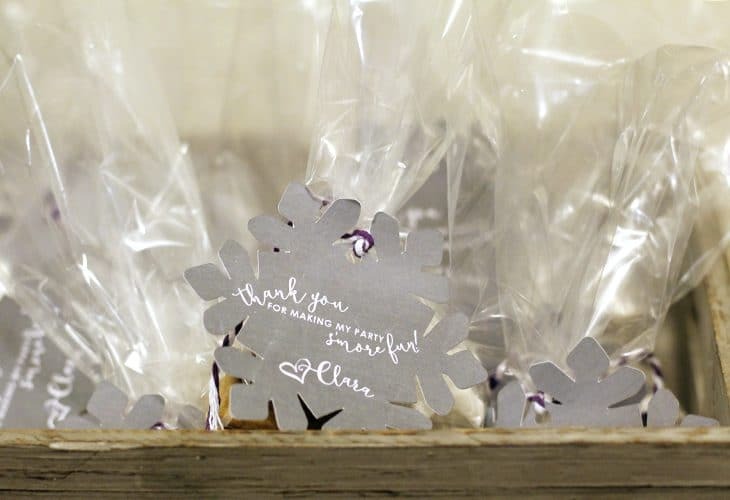 These DIY snowflake s’mores favors are the perfect gift to give your guests! When we were planning Clara’s hot chocolate bar first birthday party I wanted to come up with a cute party favor that our guests could take home. I didn’t want something super complicated or costly, but just something so that our guests could get a present too and not something that will just head straight to the trash when they get home. I had thought about making mason jar hot chocolate gifts but thought those might end up costing too much so kept brainstorming. After a trip to the decorette shop and searching for a snowflake mold it all came together! 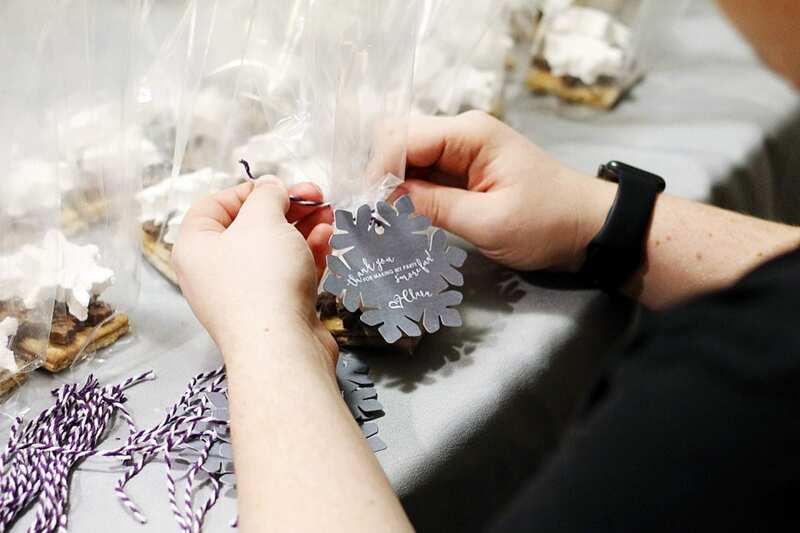 I came up with these super cute s’more party favors and I just love how they turned out and helped tie in the snowflake theme. And because I love you all, I’m even providing a FREE print & cut file to make your own snowflake tags on your favorite craft cutting machine. 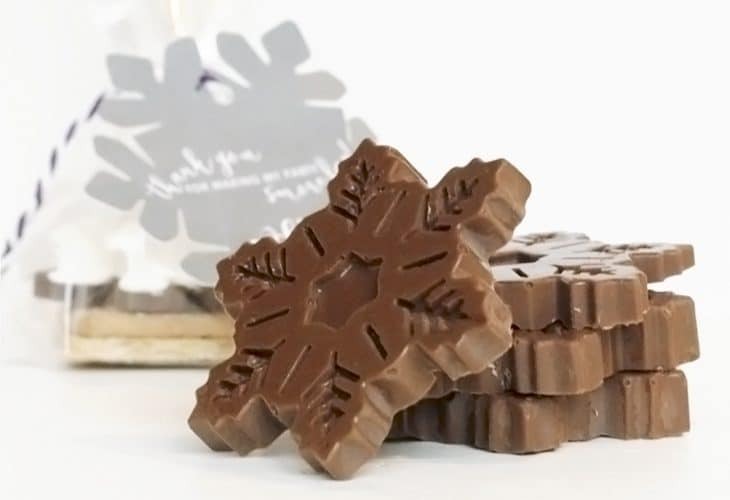 First, you’ll want to make your chocolate snowflakes. You could totally use chocolate bar squares but I loved having everything snowflake-themed so took the long route. It’s super easy though! I made these just like the snowflake cupcake toppers except without the sprinkles. All you need is to buy some chocolate melts and melt them in 30 second intervals in the microwave or over a double boiler on the stove. The key is to stop heating the chocolate while there are still a few lumps. Stir the chocolate until it is smooth as butta’. Make sure you don’t burn it so that way your chocolate keeps its shine once it hardens. Pour your chocolate into your snowflake mold whatever thickness you desire, tap it on the counter to get our the bubbles, and place the mold in the refrigerator for at least one hour to harden. If you only have one mold, like I did, you can start these a few days in advance from when you want to assemble your party favor bags and just keep your snowflakes in an airtight container as you finish each batch. Okay I’m going to cheat here and say there are food bloggers that are way more talented in making and explaining how to make recipes. So I’ll leave it to the pros and tell you we used this homemade marshmallow recipe from Cinnamon Spice and Everything Nice. Once the marshmallow mixture was hardened we cut them using a small snowflake cookie cutter. 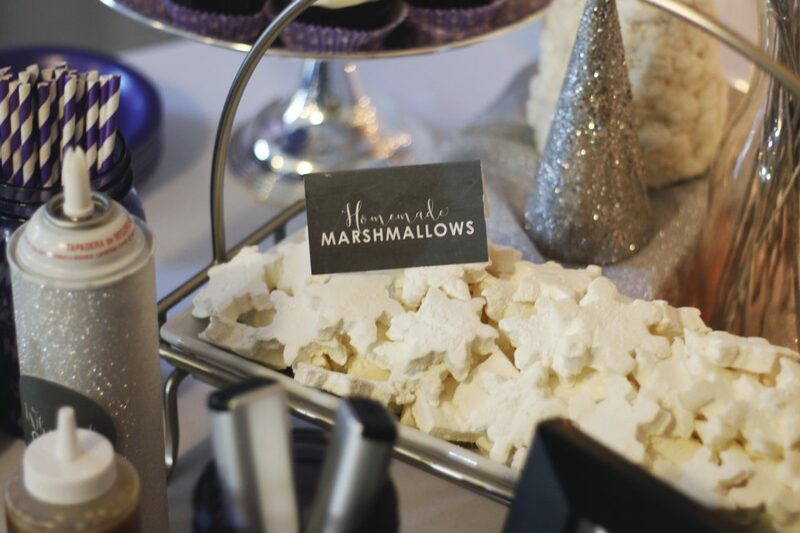 They turned out so cute and were a great edition to both the s’more party favors and also for the hot chocolate bar. All the s’more party favors I saw on Pinterest had some darling personalized tags so, of course, I decided to make some for Clara’s party. I designed them in Adobe Illustrator and then cut them out using the print and cut feature on my Silhouette Cameo. I’ve provided two files for you here so you can have your own snowflake tags (minus the “Love Clara”). One file to download and open in your favorite cutting design program to print and then the second is the snowflake shape to create your snowflake cut shape. If you have any questions on how to use the files, feel free to leave me a comment below and I’ll get back to you as soon as possible. 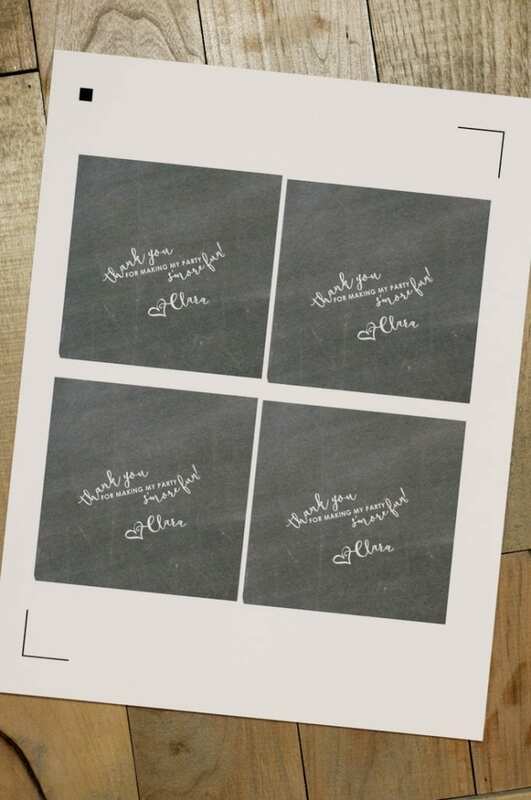 This is also a great post on how to use the Silhouette print and cut feature. Be sure to either add a circle at the top of your snowflake before you cut or use a hole punch to make a hole for your tag so it can be tied to your bag. Next up is time to assemble your goodies. I layered two graham cracker halves, the chocolate snowflake, and then two snowflake marshmallows. If you use a larger cookie cutter you could just do one marshmallow, but I loved the look of the two smaller snowflake marshmallows. Finally, put it all neatly in your cellophane bag, tie your tag to your bag, and move on to the next one. I threw all the s’more party favor bags in a crate and placed them by the door for our guests to grab on their way out. 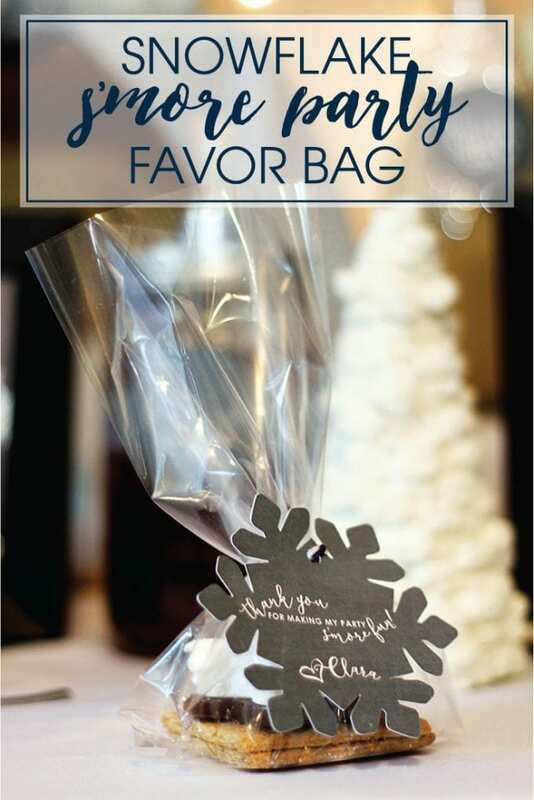 These bags turned out so cute and are the great party favor bag for your next party this winter! What do you think of these s’more party favor bags? What party could you give them to your guests? This is such a great idea! I wish I’d seen it before my Christmas party. So cute! What a wonderful idea for a party favor! Mmm, any excuse to make s’mores! I love this! What a cute idea!! These favors are adorable. 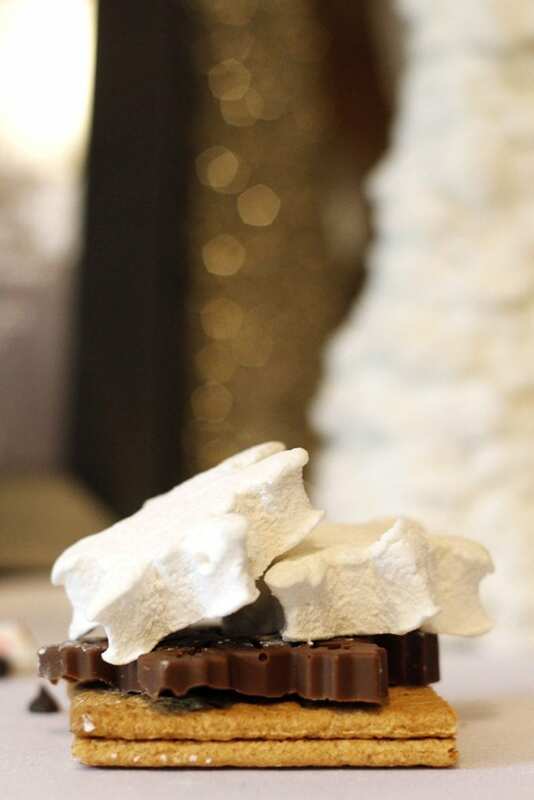 I love how you added snowflake touches to a s’mores favor. What a sweet way to thank your guests for coming! Oh my gosh, Amanda! SUCH a cute idea. I LOVE the snowflake chocolates and marshmallows! I would imagine so much work, but so worth it! Great job, girl! Thanks, Megan! I had so much fun putting them all together! The download links for the snowflake tags seem to take me to a dropbox file that is no longer there. Is there another link, or would you be willing to email me the files? Thank you so much! Hi Brigitte! Sorry about that. I sent you the pdf. Let me know if you didn’t get it.